Home / "A Really Lousy Prophet"
The Book of Jonah is the comedic tale about a lousy prophet. I’ll give you a quick rundown on the book. 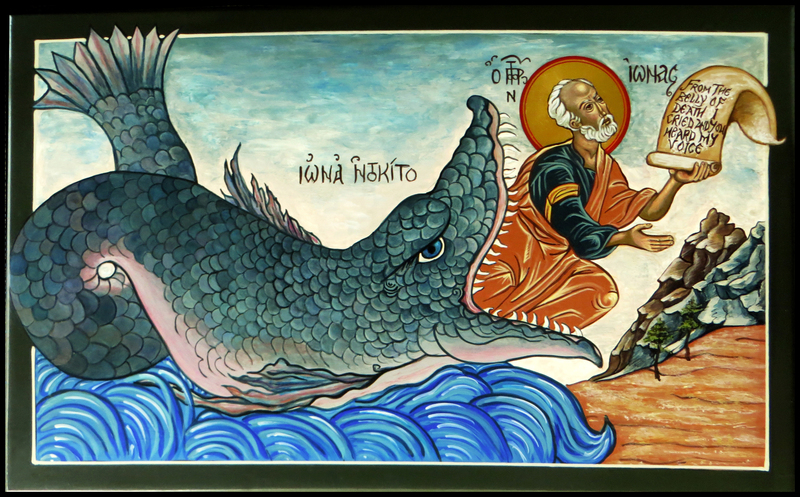 Most people know about Jonah being swallowed by a big fish. What most folks don’t know is the whole parable. So, here goes. God tells Jonah to go, and preach to Niniveh, the powerful capital city of the Assyrian Empire, located in present day Iraq. Known for their cruelty, the city’s population is in need of a change of heart. Bear in mind (for this is important), the Assyrians were not Jews. They worshipped other gods. In fact, they were the enemies of the Jews. Jonah’s response? “Nope.” Not interested—remember, he’s a lousy prophet. And really, can we blame him? He runs as fast as he can and boards a ship to Tarshish to get away from God. As if such a thing were actually possible. So, we’re not surprised when a huge storm comes upon the ship and threatens to scuttle it. The sailors pray to their own gods for rescue. Then the superstitious crew casts lots to see who on board might be responsible for the storm as a result of some terrible act. Sensing death is close on the horizon, Jonah fesses up that he is on the lam, running from his God, and the storm is most likely his fault. The sailors try to save the ship. Nevertheless, it becomes clear that the only way to save the ship is to toss Jonah overboard. Into the sea goes Jonah, the storm abates and Jonah is swallowed by the big fish. Now, I imagine there’s nothing quite like being swallowed by a big fish to make a person begin to see things clearly. Now that he has some time to think, Jonah repents, and by the third day, with a disagreeable prophet in his belly, the nauseated fish upchucks Jonah onto the shore, next to the city of (you guessed it) Nineveh. Jonah realizes there is no getting away from the task God has given him. And making his way to the city delivers the most grudging and uninspired prophetic warning ever uttered by a prophet—all of eight words, the absolute minimum: “Forty days more, and Nineveh shall be overthrown.” I imagine he threw in a hearty dose of glee with which to top it off—remember, Jonah was no fan of the Ninevites. Now, here’s the remarkable thing—the people repent. The king, the citizens—and (get this) even the animals—they all repent. They have a change of heart. And, what’s more, God has a change of heart towards them as well. And God does not destroy the city. Did I happen to mention that Jonah was a lousy prophet? The parable ends with God reprimanding Jonah, who is now complaining about the bush which God causes to wilt in the face of Jonah’s wrath saying: “You are concerned about the bush, for which you did not labor and which you did not grow…And should I not be concerned about Nineveh, that great city, in which there are more than a hundred and twenty thousand persons who do not know their right hand from their left, and also many animals? In a nutshell, in addition to having a bilious personality, Jonah’s problem is that he is a bigot and a racist. My people don’t like Ninevites or any Assyrians. We are enemies. They have a different religion. They are of a different race. They are not Hebrews. Since they are not my people, they cannot possibly God’s people. It’s worth pausing for just a moment to contemplate these four chapters of mirth comprising the book of Jonah, and recall that they are placed smack dab in the Hebrew Bible (the Old Testament). The Book of Jonah is a comedy with an important message about God’s love for all people—even the enemies of the Hebrew people. Isn’t that amazing! One of the most beautiful things about the bible is that it is not a piece of propaganda. It speaks the truth about us, at our best—and our worst, and it calls us to strive continually towards a better a (holier) way of life. It’s a great story and it endures today because it tells us something intrinsically important about God and about ourselves. God, you see, loves all people—and ultimately wants the best for everyone. And us—well, sometimes we’re a bit like Jonah, not wanting the best for everyone—particularly if we perceive them to be our enemies. So, this morning, I invite you to ponder, if just for a little while, what your personal version of “Nineveh” might look like. Where is it that you would not want to be sent? Who are the people you would go just about anywhere to avoid having to speak? Your Nineveh could be another country, or it could be a set of people espousing a particular ideology.